Today*s layout is of my talented boyfriend practicing his mad soccer skills. 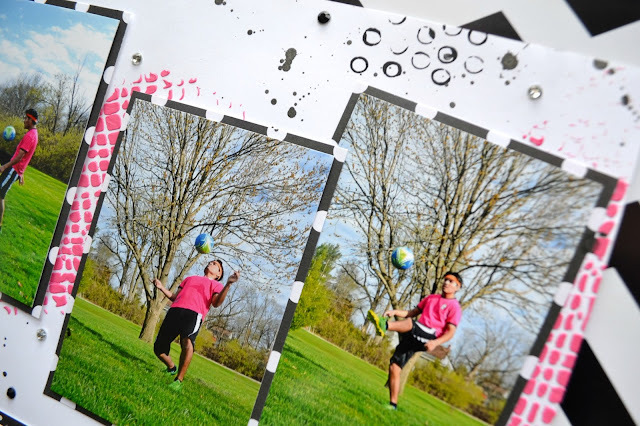 I wanted to be able to display several fun action shots with a 4x6 focal photo. To achieve this I divided my layout in half by staggering smaller photos in a line on top and my dominant photo on the bottom. This allows your eye to move easily around the layout. After positioning my photos I choose a color scheme from my photos. Because the photos are vibrant I decided to keep the main background white. I could of easily chosen green or blue, but I decided to go with pink for the accent color. Yes, pink for a guy layout. I probably wouldn*t have picked that particular color, but luckily he was sporting it that day. Yay! For the background I just had a ton of fun. :) I wanted to have an edgy street style vibe...well that*s what I think it is, lol. So I grabbed my modeling paste, Tim Holtz burlap stencil, apple barrel paint (pink & black), Heidi Swapp Color Shine (black velvet), a drinking straw, and a pencil. I started off by mixing pink paint and a small amount of modeling paste together. Then I used an old gift card to scrape the paste across my stencil in random places on my paper. But I did note where some of my photos were going to be placed so I could have some color peeking from behind. Don*t waste leftover modeling paste. Use it on another piece of paper for a future layout as a background base or tags. Then I dipped my straw in black acrylic paint and stamped it in clusters for an abstract look. I also used the same method with a pencil point. Afterwards I splattered Heidi Swapp Color Shine on my layout by removing the sprayer and shaking it above the layout. My photos looked a little bare to me, so I added a black and white mat border to my smaller photos. For the dominant photo I layered my mat and added a zig zag stitch with my sewing machine for more texture. I also added a little bit of bling with black and clear gems from Paper Studio. I LOVE how my layout turned out, especially how the photos pop on the page. Before I forget, I wanted to point out I added my journaling to the backside. If you are stuck on journaling I highly recommend answering the questions: who, what, when, where. I usually write more, but that is a great starting point. From that I could write what my favorite trick was, ask Alfredo how long he has been playing, how did he get into the sport, etc.